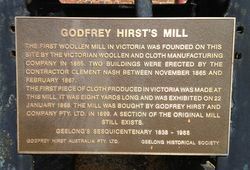 The plaque at the site of Geoffrey Hirst`s mill commemorates the Sesquicentenary of the settlement of Geelong from 1838 to 1998. The Victorian Woollen and Cloth Manufacturing Company was founded in Geelong in the late 1800’s by Godfrey Hirst, an English immigrant from Yorkshire, England, which was the centre of textile manufacturing. Its predecessor, The Victorian Mill, was a manufacturer of wool textiles. With changing times, and the ability to see the possibilities, Godfrey Hirst purchased the Victorian, the company that had employed him when he first arrived in Australia. His ability to manufacture first quality textiles, helped eliminate Australia’s dependence on England for cloth. The company continued to manufacture various textiles until the 1960’s, when Godfrey Hirst Carpets began production. It quickly became the largest manufacturer of carpet in Australia. It continues to manufacture residential and commercial broadloom carpets in all fibres, while specializing in the production of wool broadloom products. Godfrey Hirstwas born on 6 January 1857 at Royd Edge, Meltham, near Huddersfield, Yorkshire, England, son of Charles Hirst, spinner, and his wife Minerva. Trained as a weaver in a family business, Hirst arrived in Victoria for the sake of his health in 1885. Initially an insurance agent in the Western District, he soon joined the ailing Victorian Woollen & Cloth Manufacturing Co. in Geelong, only to disagree with its management over the best means of competing with imports. Believing that there was a living to be made from quality products, Hirst decided to go into business for himself. Renting a shed in Fyans Street, he built his own loom and, using yarn supplied by his former employers and the Albion mill, began manufacturing flannels in 1888. Doing well despite the pall hanging over the industry as a whole, he moved to larger premises in 1889 and, in partnership with Charles Shannon, a woolbroker, and Charles Smith, a fellmonger, bought the defunct Barwon woollen factory in July 1890. Renamed the Excelsior Number One mill, the old factory prospered and, with Hirst in personal charge of its raw materials and sales, employed about one hundred people by February 1895. In 1899 the adjoining Victorian factory was added to the proprietary and refurbished as the Excelsior Number Two mill. Advantaged by interstate free trade after Federation and government contracts during World War One, the firm's pay-roll increased to more than 300 in 1917. The company then manufactured blankets, rugs, tweeds, and worsteds as well as flannels. After the death of Charles Smith in 1908, the business was incorporated as Godfrey Hirst & Co. Pty Ltd in October 1909. In 1911 and again after the Number One mill was destroyed by fire in March 1912 Hirst returned to England in search of the latest machinery. 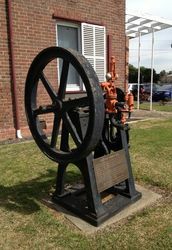 In Geelong he supported the Gordon Technical College as a centre of textile education and was its president in 1913-16. His principal avocations were the Belmont and Corio clubs, music and bowls. A self-taught musician, he was organist at St George's Presbyterian Church from 1889 and a vice-president of the Geelong Musical Society. He also sponsored the Excelsior Mills choir and was active in the musical life of the Belmont Methodist Church. A man of strong principles and high expectations but reserved and lacking the common touch, he once stood unsuccessfully for the South Barwon Shire Council. He became a justice of the peace in 1908. Hirst died after several years of failing health at his home, Royd Grange, Belmont, on 15 February 1917 and was buried in the Methodist section of Geelong Eastern cemetery. The first woollen mill in Victoria was founded on this site by the Victorian Woollen and Cloth Manufacturing Company in 1865. Two buildings were erecteed by the contractor Clement Nash between November 1865 and February 1867. The first piece of cloth produced in Victoria was made at this mill. It was eight yards long and was exhibited on 22 January 1868. 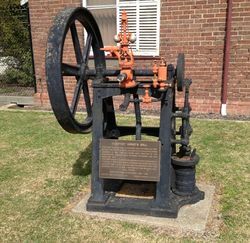 The mill was bought by Godfrey Hirst and Company Pty Ltd in 1899. A section of the original mill still exists. Godfrey Hirst Australia Pty. Ltd.